Consolidation of invisible voids is imperative for structural preservation! Grouting can extend the life of existing structures that have experienced severe degradation due to scour or freeze/thaw damage. It rarely involves the need for heavy equipment, resulting in an economical method of restoration. Brennan performs several types of grouting both above and below the waterline with experienced divers and topside crews working closely together. We have a lot of experience grouting in areas between dam structures and their foundations. Voids caused by scour and erosion are common in water based infrastructure. 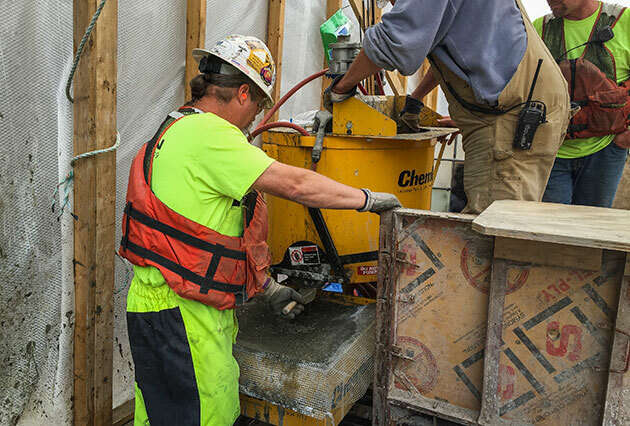 Grouting reconnects the structure with its footings and subsurface piling. In some cases where there are unbraced lengths of piling, grouting will be used to establish a long-term reinforcement. We also use void grouting to fill around pipes and penstocks. Leaking pipe structures often experience scour, and grouting these structures can help slow the leak and prevent further scour. Brennan has the equipment and the experience to mix and pump flow-able fill, as well as low density cellular grout/ concrete. Low density concrete is often used to fill voids without adding significant weight. Water cutoff grouting is the process of injecting grout into the ground to stop water from creating subsurface voids. This includes grouting cracks or other imperfections in concrete, rock, or other substrate. For water cutoff grouting we use with chemical or cementitious grouts dependent on ground conditions. This includes epoxy grouting of cracked or damaged concrete to reestablish strength. This is very common in degraded structures that may have voids underneath the surface. For example, masonry walls can be grouted to consolidate the wall back into one mass. J.F. 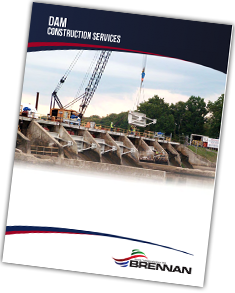 Brennan Company specializes in dam construction projects throughout United States. Download our brochure here to learn more about our grouting abilities and more. Want more information on our grouting abilities? FIll out the form below!